With a stay at Krabi City View Hotel in Krabi (Downtown Krabi), you'll be a 2-minute drive from Walking Street and 8 minutes from Krabi Pier. 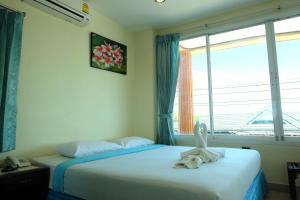 This hotel is 11.2 mi (18.1 km) from Ao Nang Beach and 11.4 mi (18.3 km) from Nopparat Thara Beach. Make yourself at home in one of the 24 air-conditioned rooms featuring refrigerators and LCD televisions. Complimentary wireless Internet access keeps you connected, and cable programming is available for your entertainment. Private bathrooms with showers feature complimentary toiletries and slippers. Conveniences include phones, as well as safes and desks. Satisfy your appetite for lunch or dinner at the hotel's restaurant, or stay in and take advantage of the room service (during limited hours). Quench your thirst with your favorite drink at the bar/lounge. Continental breakfasts are available for a fee. Featured amenities include a computer station, complimentary newspapers in the lobby, and a 24-hour front desk. A shuttle from the airport to the hotel is provided for a surcharge (available 24 hours). When would you like to stay at Krabi City View Hotel ? Each day we'll check prices and send you an email for your selected dates at Krabi City View Hotel. If you don't have specific dates but would like to check prices for say next weekend or say next month we can check the price too. Click to write a review and share your experience of Krabi City View Hotel with other travellers.